New wheel bearing kit for JD A, B, D, G, 50, 520, 530(with factory wide front only), 60, 620, 630(with factory wide front only) 70, 720, and 730 tractors. One kit used per hub. 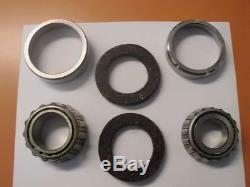 Includes, two bearings(JD7224/JD8186), two races(JD7266/JD7270), and two felt seals(D636R). The item "Wheel Bearing Kit for John Deere A, B, G, 50-730 Tractors" is in sale since Thursday, October 24, 2013. This item is in the category "Business & Industrial\Heavy Equipment Parts & Accs\Antique & Vintage Equip Parts". The seller is "w-farms" and is located in Logansport, Indiana.